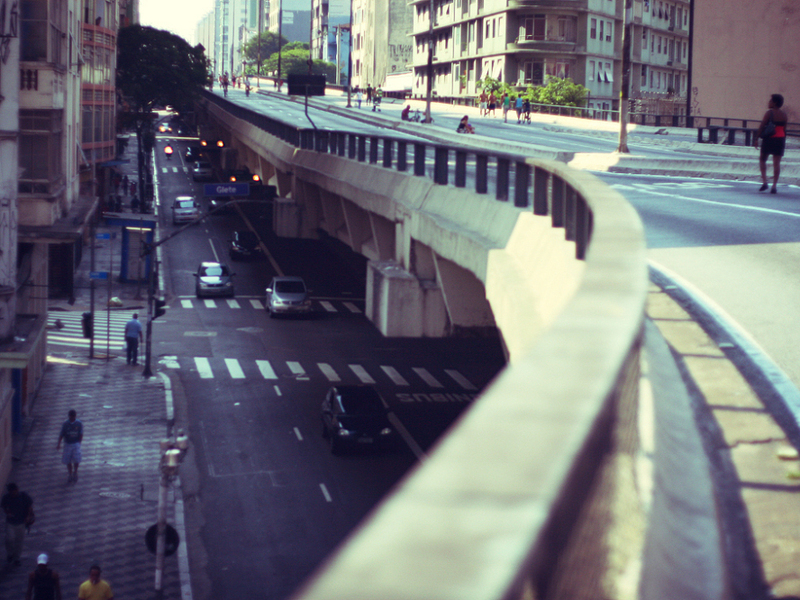 Minhocao, known as the Big Worm, is an elevated highway in Sao Paulo, Brazil. Urban planners say it needs to be taken down completely. Sao Paulo, Brazil, is an economic engine in a booming country. It's also a huge mess, with traffic jams that go for miles, crumbling infrastructure and shoddy airports. Urban planners say it needs a major makeover, including razing the Minhocao, an elevated highway known as the "Big Worm." Neide Batochio loves to sew on her old Singer, strategically placed at a desk in front of her window. She says that way she can see the Minhocao, which twists and turns feet from bedroom windows for 2.2 miles through the center of the city. She says the sound's not so bad. "I've lived here so long," Batochio says, "it's now part of my life." She did have to get used to it, though. In many ways, the Worm symbolizes the "build and build big" policies of the past, as Sao Paulo quickly expanded into a megacity with 11 million people. An acclaimed documentary, Elevado, captures the history of the Worm. "It's the biggest project of reinforced concrete in all Latin America," Mayor Paulo Maluf said in 1969, a scene that's captured in the film. In 1971, the Elevado opened to traffic. It was named after President Artur da Costa e Silva, but its shape and sheer size led Paulistas to dub it the "Big Worm." The film captures the changes that came with the highway. Gone was the old Avenida Sao Joao, venerable with its cafes. Gone were the elegant apartment houses and trolleys. "It's very symbolic of the time that it was made, without discussion and everything," says Paulo Pastorelo, one of Elevado's directors. "Less than 10 years after it was built, they already started discussion about destroying the thing." Urban planners now want to raze the Worm as part of a makeover of the city's outdated infrastructure. Anne Marie Sumner is one of them. "I think this is going to happen at some point, I mean, they're doing it all over the world," she says. "You can't face-lift the Minhocao. There are certain things there is no face-lifting to it. You have to pull it down." Demolishing the Worm is the long-term plan, says the city's urban development chief, Miguel Bucalem. The problem is what to do with all the cars because of the Worm's important role as a corridor for traffic. "[To] take it from this function would be very difficult right now for the city, because it would imply that these cars would cross neighborhoods and would really have a tremendous impact on the vicinity of the Elevado," he says. For now, those who live with the Elevado in their midst make do. Josefa Santos, sweeping the sidewalk outside her apartment building, says the noise is overwhelming. "But then when it's raining," she says, "it's a good cover to keep you dry." Few have lived with the Worm as long as Luiz Solazzi. From a storefront located just feet from the highway, he's sold eyeglasses and clocks for half a century. "This was good before the highway," Solazzi says. "It was a garden, a garden where people strolled." He knows that some planners say a subterranean highway would be the answer, replacing the Worm. Solazzi knows that a project like that would take years. He says it sounds a bit too utopian.